There are 5 water stations located each KM around the course hosted by local secondary schools. Chanting & cheering, these enthusiastic students hydrate & encourage participants. Schools are supplied with funds to decorate their water station. 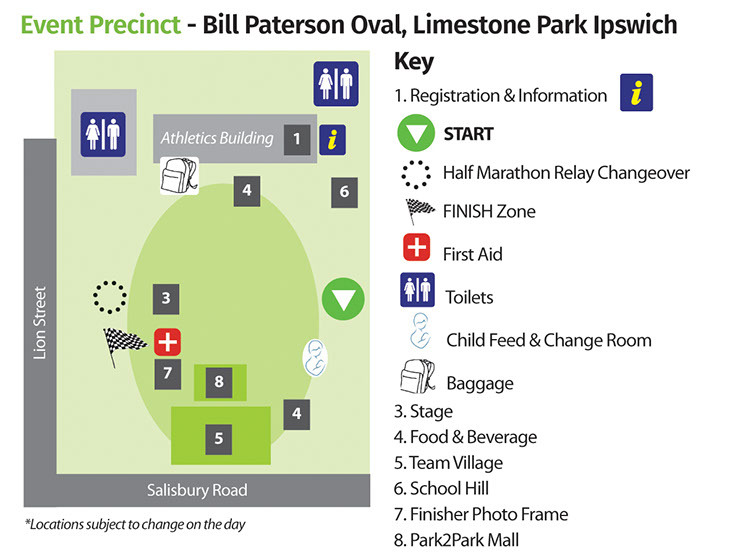 First aid support will be provided on course and first aid will be available at the finish area on the Bill Paterson Oval. If you require first aid attention on the course, please report to your closest course marshal, SES volunteer or water station. We recommend car-pooling to the event where possible to decrease congestion around the event precinct. Limited parking is available in the car park off Quarry Street, Ipswich as well as in the surrounding streets for the duration of the event. Please refer to the course map which shows area where NO parking is allowed. Lion Street is closed until approximately 7am. After this time Lion Street will re-open & parking is permitted. Course officials are located at strategic points along the 5KM course. SES personnel & Traffic Management staff will also be in attendance. Position yourself at the start line relative to your ability and your goal finish time. Do not stop or change direction suddenly. Be courteous to your fellow participants. Always follow the directions of all race officials, SES personnel and emergency services. No rollerblading, cycling, skating or skipping. Prams, strollers, wheel chairs and participants with pets should start at the back of the start area. An information booth is located in the Registration Area on Bill Paterson Oval. General questions and information can be asked here. A sunscreen trailer is located at the event precinct. Please help yourself to this service. On completion of your event, you will be welcomed into the recovery area by Bendigo Bank community volunteers. Here you can collect your finishers medallion plus fruit and water to help with your recovery. A photo finish opportunity is available right outside the recovery area to take your photo in front of the finishers sign. Be sure to get your friends and capture a snap to #tag on social media. The Ipswich Hospital Foundation Park2Park offers a child feed and change tent for parents. This tent is hosted by the volunteers of the Ipswich ABA group to provide you with a comfortable place to tend to your children’s needs.